No more having to reach into your pocket to message someone back via Facebook while browsing on the iPad, thanks to the universal build now available. Facebook today updated the standalone Facebook Messenger app for iOS to version 7.0, and iPad owners finally have something to cheer about now that the app works natively on their favorite smartphone as well as tablet. If that wasn't enough for iOS users to get excited about, the update also allows videos shot inside of the Messenger app to be saved to the device Camera Roll, where they can be shared to other apps as well. Facebook is also making it easier than ever to invite friends already using the social network to join the ranks of Messenger users, and promises the app will also be "more reliable" thanks to other, unspecified fixes. 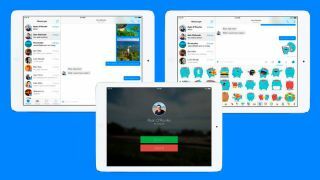 Now a universal build offering a native experience across iPhone, iPod touch or iPad from a single app, Facebook Messenger 7.0 appears to be making the most of the larger tablet display. On the iPad, the Recent, Groups, People and Settings tab now appear on the left edge of the screen in both portrait and landscape views, while your ongoing conversions have plenty of room to breathe on the righthand side. The iPad is also a great place to send friends some of those decorative Facebook stickers, which are now displayed across the bottom of the screen, where they presumably look pretty awesome on a Retina Display. Otherwise, Facebook Messenger 7.0 for iOS offers the usual complement of free text and call options (including internationally), private photo sharing, the ability to record voice messages and one-tap access to jump between Messenger and Facebook apps. Find out the latest on Apple's rumored iPhone 6 right here!